When I last posted a few months ago, I provided you with more of a general overview of how I compose, and why. In this entry however, I am going to be looking at one of my earlier experiments in more depth. Today the focus is on the first piece I composed while studying at my Bachelor of Music, Chaotic Control (or C.C. for short). Though I was unaware of it at the time, this piece would be the spark to my exploration of using chance and indeterminacy as compositional tools. Interestingly enough (or at least to me) C.C. was also the first composition I wrote while studying at Bachelors, so it was kind of inevitable that my focus would remain on that subject. What are the chances of that?! I have always had somewhat of an obsession with probability and chance; it even topped algebra when I studied Mathematics at GCSE. I used to roll dice, flip coins, count counters, all just so I could stick the numbers into graph and calculate the probability of one thing or another. I’m still not sure why I loved it so much back then. I can however tell you that today, my joy of using chance and indeterminacy in my music is mainly down to the way it keeps a composition alive. Even the more prescribed uses of chance can surprise me as a composer, if not the performer, or the audience. In fact, despite C.C. being my first attempt at aleatory, I would argue that the rules for the process behind the piece is probably the most complex I have created to this day. This is more than likely due to the fact that I had no idea that dice with more than 6 sides existed. I was but a baby Geek back then… though a very established Whovian (google it… you won’t regret it). However, I discovered a problem when I attempted to use more than one 6-sided die: The minimum total that you can roll is that of the sum of the lowest numbers on the dice. Long story short, I used algebra to solve the problem (I did warn you). I’m not going to bother going into detail in this blog, instead I have provided a link at the end of this entry to the rule book and final score if you wish to read it in depth (and possibly attempt it for yourself). I won’t hide the fact that what you will read is written by someone at the beginning of their studies, and therefore I had yet to master the level of writing needed for a higher academic plain. I may create a revision in the future, but I refuse to sweep under the rug anything from my past. If I started doing that, I would forever be hiding pieces I’ve composed that I had once loved, just because it didn’t reflect my current abilities. Here’s the thing: Every piece I have composed, reflects my ability and curiosities of the time. Especially anything composed for my studies. With that in mind, the next part of that particular composition rules was much simpler: I had criteria to meet, therefore I had to compose using a technique we had learned over the course of the module. It is worth mentioning that C.C. was composed before I even knew the name John Cage, so aleatory was not a term I knew about until my tutor, Lauren Redhead, reminded me in one of our tutorials a few weeks before I had to submit my technical portfolio. This piece makes no mention of Cage, simply because he was unknown to me when devising the rules. (This is not an excuse I can use now I’m studying at Masters level). As with most things I do, I just had to overcomplicate matters. Therefore, instead of composing a piece with only 1 technique, I combined 2. (In retrospect, I combined 3! But that’s not important at this moment). The two techniques I combined were Olivier Messiaen’s Mode of Limited Transposition (MOLT), and Sir Peter Maxwell Davies’s Magic Square Techniques. There’s no point me going into a long explanation here in this entry. For a 1st year Bachelor Students’ interpretation of what those tools are, take a look in the handbook at the end of this entry. My Magic Square utilised a simple Sudoku puzzle of my own creation. This was the first time I had ever completed the creation of a Sudoku puzzle. 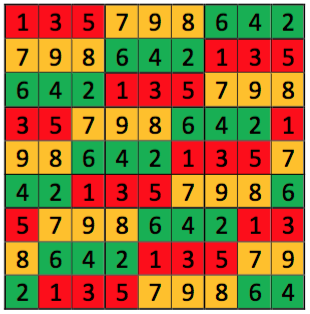 Whilst as a puzzle it was fairly useless, it did contain a pattern that cycled through the squares which loop back on itself had the grid been extended beyond 9×9. Interestingly however, the notation were the trickier parts of the piece. I had to ensure that not only did I follow the rules I had lined out, but also that it was readable for the performers (that have yet to perform this piece). Theory has never been my forte (no pun intended here… ok, maybe a tad). As I study my Masters, and even with my love for Analysis, the finer points in regard to the theoretical side of music can and I believe always will evade me. However, as a composer it is my duty to take a punt at it. And take a punt at it I did. It may not have been the tidiest of scores I’ve produced, but it was one of the most enjoyable. Despite its flaws, I still wish to hear a real brass ensemble take a stab at it. Even if it’s just for the technical feedback. I could go on about this piece, but I’m sure you all have procrastinated in your day already (I know I have). So, I shall leave you links to the Chaotic Control Score and the Rule Book. I look forward to finding out what my next entry will be about…. You can read more about Jason’s work on his website. The School of Music and Performing Arts would like to thank Jason for his contribution to the blog and look forward to future entries!